Сan't you still choose a chest of drawers for your bedroom? Do all the proposed options seem cumbersome or not fit into the design of your room? Or you just want something original, don`t you? 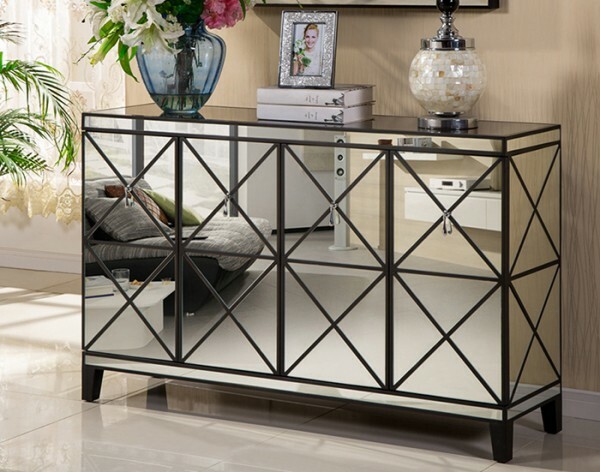 Have you ever thought about purchasing a mirrored chest? The good chest of drawers combines large capacity, compact size and, at the same time, good appearance. The mirror surface can enhance these properties significantly. For example, the combination of flat surfaces of furniture with the mirror coating without patterns will create the effect of invisibility. It will be especially felt if you choose the successful placement of such a dresser in your room. The secret is quite simple: the mirrored chest will reflect the floor and walls, which are usually rather monochromatic. Thus, such furniture will appear transparent. This will increase the visual space of the room. Of course, the chest does not have to be rectangular. The mirror coating does not limit the variety of forms of the furniture. The mirrored chest of drawers of any shape will look easy and translucent. The universalism of mirror furniture is another important advantage. Such a dresser will reflect the objects around it, which means that it will immediately fit into any interior as if chameleon. And if you put a lamp on such a chest, the light will be even more due to its reflection. The coating can also be made from an antique mirror. This means you can add temper to your dresser. The patterns of the mirror can harmoniously complement the shape of the dresser. Such a dresser will be a noticeable addition to your interior, especially if you prefer an antique style.